Lamb Henry is a lovely mini shoulder joint that is just perfect for slow cooking on wintry evenings to warm you up nicely! They are super simple to cook and really delicious just follow our cooking guide below. 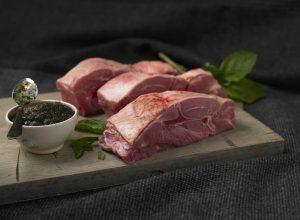 Place your Lamb Henry’s in an oven proof dish with the water and stock cube and place in the oven for 2 1/2 – 3 hours or until the meat is meltingly tender and and bone just slides out. Remove the Lamb from the dish and skim off the fat. Pour the cooking liquid into a pan on a medium heat and reduce down a little. mix the cornflour with a little cold water and add to the pan along with the redcurrant jelly. Stir until thickened slightly. Serve with a lovely pile of buttery mash and seasonal greens.